It’s getting dark...the cold doesn’t seem so bad now...I feel sleepy...just before I close my eyes for the last time I recall the the events that led me to this point. Its December 1941. Our forces are at the gates of Moscow. The war in the East has been an outstanding success. Similarly, our boys in North Africa have been advancing against the British. The Reich’s forces are now deployed far and wide...from the tip of Norway to the middle of North Africa...from the coast of France to the gates of Moscow. A vast area and one that requires extraordinary efforts to keep resupplied. Part of this resupply effort, especially in Norway and Africa involves the use of merchant ships. Sometimes singly, sometimes in groups. Never existing in great numbers, these ships are vital to Germany’s continued war effort. As such they are accorded what ever protection either the Luftwaffe or Kriegsmarine can offer. Unfortunately, this protection is sometimes less then desired. The Kriegsmarine especially finds itself desperately missing the destroyers lost during the Battle for Norway. In the case of the Luftwaffe, it is simply a case of being unable to be everywhere at once. The Battle fronts especially are the focus of fighter wings. Because of these deficiencies, the Allies start to take a steadily increasing toll on our ships. Although some are lost to submarines and mines, by far the worst is the torpedo bombers and heavy fighters. These prey on our ships like vultures. Enter a proposal from a Fw200 crewman - why not give the ships their own fighter protection, just like the Allies have started doing with their Catapult Aircraft Merchantman (CAM) ships? These ships have a single rocket launched fighter, usually a Hawker Hurricane, fitted to provide immediate fighter protection for the ships. After some debate, it is decided to trial it. Initially it is decided to use Messerschmitt Bf-109T fighters from the aircraft carrier Graf Zeppelin since these were already equipped with the necessary catapult launch attachments and were about to be retired after a brief use by I./JG 77. Starting in early 1942, these start to be trialled. Initially they are a success with ships equipped with them able to better ward off attackers. Unfortunately though, it soon becomes obvious that the Bf-109Ts are in limited supply, especially since the aircraft is lost after each launch. At first it is proposed to use new Bf-109Gs as replacements, however this is quickly quashed since these are in need for the front lines. This presents a problem, since a high performance fighter is definitely needed as Allied attacks step up. Looking around for ideas, a novel one is suddenly presented by Professor Willy Messerschmitt. A project his company has been working on seems perfect for this application. 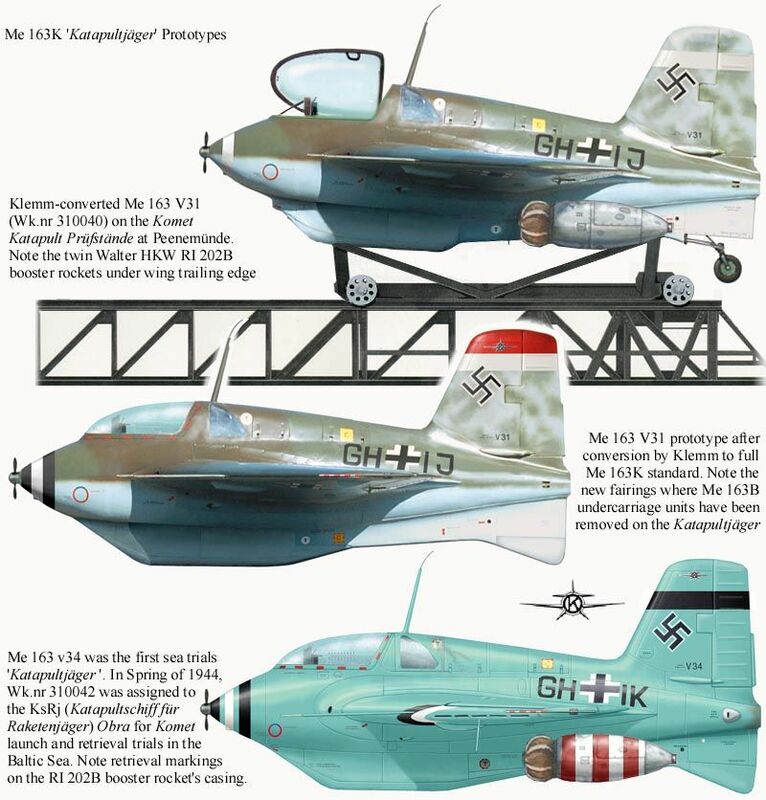 The Me-163 Komet is a small, rocket propelled interceptor that has been being developed by the company ever since its designer, Alexander Martin Lippisch and his team joined Messerschmitt from the Deutsche Forschungsanstalt für Segelflug (DFS). Not only does this design not call upon the resources of the main frontline fighters (it doesn’t even have a piston engine), it also provides a outstanding increase in performance over the Bf-109Ts. Trials are quickly conducted and prove to be a success. Starting mid 1942, the first Me-163K (for Katapult) are fitted to ships. 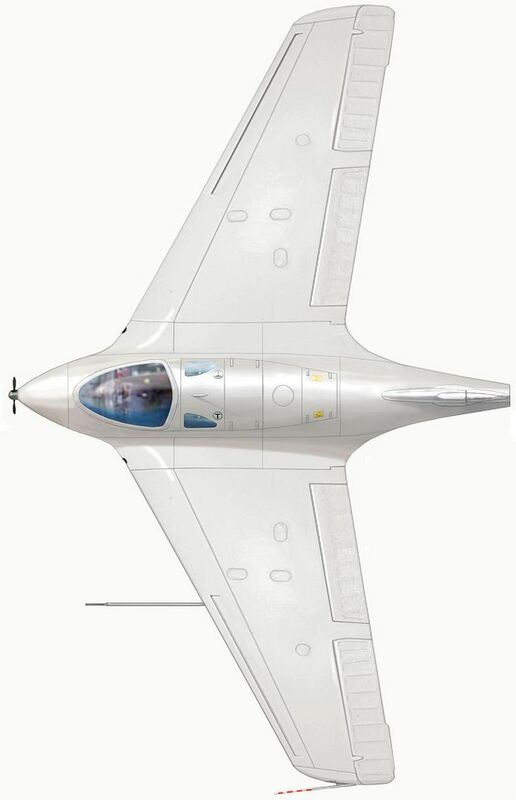 These aircraft have no landing gear what-so-ever and are also fitted with a pair of solid rocket boosters. Unfortunately these aircraft, although providing outstanding performance, also soon proved to be almost as deadly for their pilots. To start with, the fuel used was particularly dangerous with accidents resulting in fires or even explosions especially dangerous. In more than one instance, a Komet exploded on the launch rails. Just as dangerous was the recovery. As part of a desire to reduce the need to replace the aircraft after each launch (as was the case with the earlier Bf-109T), the Komets were made able to be recovered. 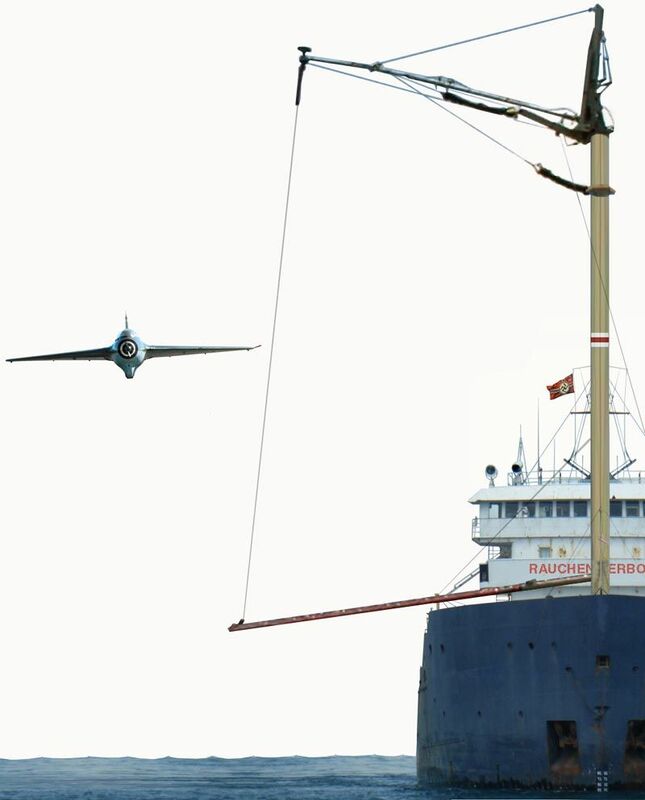 Using what was known as “the lasso” ( a rope loop suspended from a crane on the side of the ship), at the end of its flight the now unpowered Komet glides back to the launch ship. 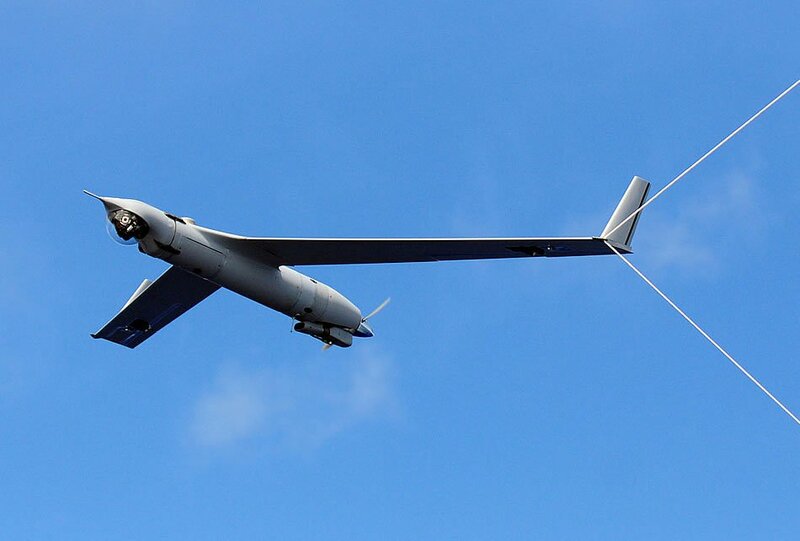 Here the pilot aims to catch the lasso using a special probe on the end of one wingtip. When successful, the rope (which is attached to a shock cord to reduce stress on the airframe and pilot) brings the aircraft to an abrupt stop and holds it suspended midair. At this point the Komet is then brought back on board and readied for another flight. Unfortunately, although sounding straightforward in theory, in reality this was far more difficult with pilots often either missing the loop or even snapping off the probe after capture and then being lost as the Komet was caught in the turbulent water right next to the ship. There were even cases where the shock of the capture resulted in the Komet exploding as remnants of fuel were shaken together. Despite these dangers, the Komets were soon being fitted to as many merchant ships as could accommodate them. Typically each ship would carry either a single aircraft or at most two (the second being a partially disassembled spare in case the first was lost). In addition, the use of Komets was soon expanded to also include their use by Kriegsmarine combat vessels ranging from Destroyers right through to the Battleship Tirpitz. The decision to expand such operations came as the Allies increasingly targeted these vessels. beneath the wing trailing edge. The middle aircraft is Wk.nr 310040 after Klemm has converted this Komet to more full 'Katapultjäger' standards. and the installation of a portside wing hook for at-sea retrieval of the interceptor. The bottom aircraft is another Messerschmitt-built prototype, Wk.nr 310042. Me 163 v34 was the first sea trials 'Katapultjäger'. In March 1944, Wk.nr 310042 flew from a converted freighter, the KsRj (Katapultschiff für Raketenjäger) Obra, in the Baltic. Launch and retrieval trials were held as Klemm-built Me 163Ks were being prepared for delivery to operational Katapultschiffe. 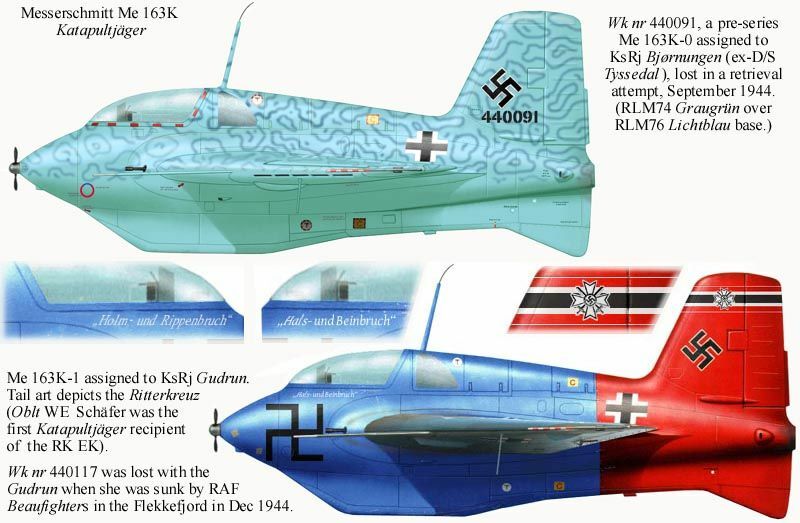 The Klemm logo (inset) is displayed on the fins of both Me 163K prototype conversions. Readying: First thing each morning (night operations were rarely contemplated), the crew would ready the Komet for launch. This involved fueling the aircraft and making sure all systems were operational. After this, the pilot would sit and wait either in the cockpit or just nearby. Enemy Sighted: Once enemy aircraft were either reported as inbound or sighted, the pilot would strap themselves in whilst the support crew would throw off the protective covers that prevented sea spray and water from damaging the Komet. Launch: As soon as the covers were removed and the pilot ready, the support crew would launch the Komet. This involved the releasing of all clamps and the igniting of the two solid rocket boosters (referred to as “the firecrackers” by the crew and pilots alike) near the tail. These burnt for some 10 seconds and not only propelled the Komet along it’s short launch rail but also helped accelerate it in the air. Interception: Depending on the target, the pilot either zoomed to altitude and dived down on the attacking aircraft or if the attack was particularly close, headed straight towards the attacking aircraft, often at sea top level. In most cases, the actual interception was conducted at very low level with the Komets zooming in behind the attacking aircraft to make quick, slashing attacks. Even if they weren’t successful in shooting down the attacker, if they were at least able to make them break off their attack it was enough. Recovery: Following a brief engagement - lasting typically 5 - 8 minutes, the surviving Komet (not always a guaranteed thing as apart from the risks already mentioned plus that of being shot down, it wasn’t unknown for the pilot to misjudge and simply fly into the wavetops at high speed) would then glide back to the ship to attempt the before mentioned “catching the lasso”. Head on view showing Me-163K about to be recovered. The dangerous, all or nothing style of the Komets soon earned their pilots the nickname “The Death or Glory Boys”. Applying mainly to the dangerous operations they conducted, it was also enhanced by the quickly adopted practice of the pilots painting their aircraft in highly unorthodox, and often quite garish colour schemes, often harkening back to the days of the WWI Flying Circus. At first this came about due to the desire for the Komets to be highly visible, not only to the gunners on their own side but also in the case of a water landing, so that they could be quickly spotted and hopefully recovered. Soon though, the schemes became a mark of individuality. Moreover, when Reichsmarschall Hermann Göring (last commander of the famous von Richthofen Jagdgeschwader 1) personally approved of their markings (calling them “...a mark of a true fighting spirit”) they became almost mandatory. 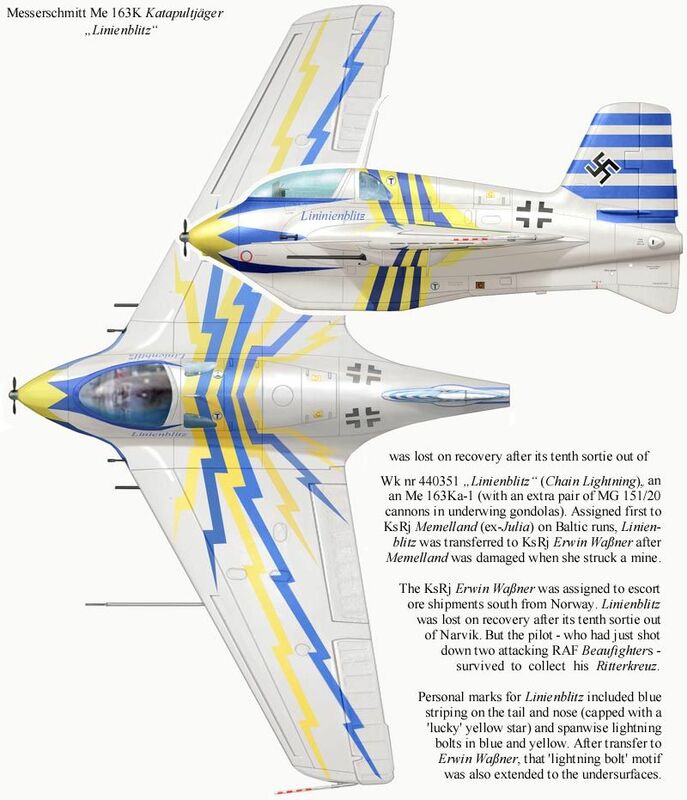 All this of course brought even more attention to the Komets with articles on their exploits, especially of the few individual pilots who were successful, being widely distributed. In these, the pilots were often portrayed in Wagnerian tones as some sort of modern Knights defending the ships. The propaganda usefulness of all this was quickly recognised with pilots also being quickly adorned with medals. Typically, a single successful mission would earn the recipient the Iron Cross 2nd Class. Between three and five missions would typically result Iron Cross 1st Class being awarded. Ten missions, (rarely ever reached) would result in the Knight's Cross being awarded. Even the Allies indadvertedly contributed to this view of the Komets referring to them as “those incessant stinging fleas”. So, how did I find myself as one of these “Death or Glory Boys”? Although I was always interested in flying and even tried gliding a few times as a boy growing up in Kiel, the need to make a living soon saw me join a merchant ship. When war came, I was already aboard a ship and thus was free from the risk of being called up for active duty. Over the next couple of years I undertook numerous resupply trips and experienced first hand the terror of being attacked from the air. In 1943, following one particularly devastating attack where our ship barely limped into port, I decided that I had had enough and wanted to be able to fight back. I therefore volunteered for duty as a Komet Flier. Luckily, my application was accepted and I entered the accelerated training program (consisting only two months of training, mostly on gliders, though with a couple of powered flights...for someone who may only fly one sortie they weren’t going to expend a lot of training effort). After this, I was posted to my new ship, a freighter operating on the Northern run to Narvik. This was a particularly dangerous route since it was often attacked by Allied Beaufighters and Mosquitos. Moreover, if one ended up in the water, you only had a matter of minutes before the cold overtook you. Despite all of this, I soon found myself being successful. My first mission was a false alarm with the enemy aircraft not appearing despite their reportedly being inbound. The next was a Sunderland at altitude. This resulted in my first kill, despite the supposed difficulty of this sort of target. Over the next few months, I undertook a couple of missions and managed to once again get a kill...and to survive. This brings me to the events of today. It was 0800 when the siren went off. We had only prepared my aircraft (adorned in yellow and blue lightning bolts over a white background and with a bright yellow six pointed star on the very nose - my lucky star as I referred to it) a few hours ago. I was already sitting in the cockpit, so quickly did up my seatbelt buckles and signaled for the support crew to “light the firecrackers”. These lit with a kick that pinned me back in the seat. Before I knew it, I was already rocketing along in excess of 800km/h in a shallow climb. I quickly looked left and right for the attackers. There they were, Beaufighters coming in low and fast. I dove down towards them preparing for an initial head on attack (hopefully this would put off their aim on my ship). I pressed the trigger and the two 20mm cannon - I preferred these over the slower firing 30mm version - burst into life. A hit! The lead Beaufighter was hit right in the cockpit and smashed into the sea. As I shot pass the attackers, I pulled up, banked and then rolled in behind them for another attack. This time, I quickly lined up on the trailing Beaufighter and let loose with another burst before shooting over the top of them. Another kill! Then suddenly, just as fast as it started, the attack was over. I had managed to scare off the remaining two attacking aircraft. I thought about pursuing them but decided that that would be pushing my luck. Instead I zoomed skyward burning off the remaining fuel. Once that happened, I glided back down in a slow spiral, all the time looking for new attacking aircraft. Then as I reached low level, I lined up behind the ship and aimed just off it’s port side as the lasso was swung out. This was always the tricky part. Coming in and trying to match my speed and track as closely as possible to that of the ship whilst avoiding becoming too fixated on it and stalling or even careening into it (as some pilots had done). I aimed my wing tip...there, caught the lasso! Then just as the aircraft swung back, the hook snapped! ....It doesn’t look like they will...I can feel the cold entering my body and am struggling to keep my eyes open...this is it. Suddenly, I feel a jolt as I am reefed out of the water by a crewman as the ship passes by. 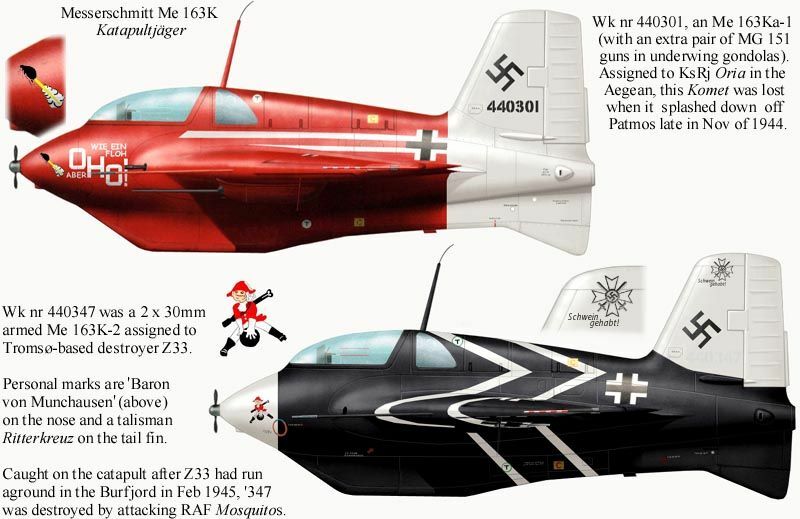 The first aircraft is an Me 163K-0. These pre-series aircraft were assembled at Böblingen from Me 163B parts built by both Leichtflugzeugbau Klemm GmbH and Messerschmitt. 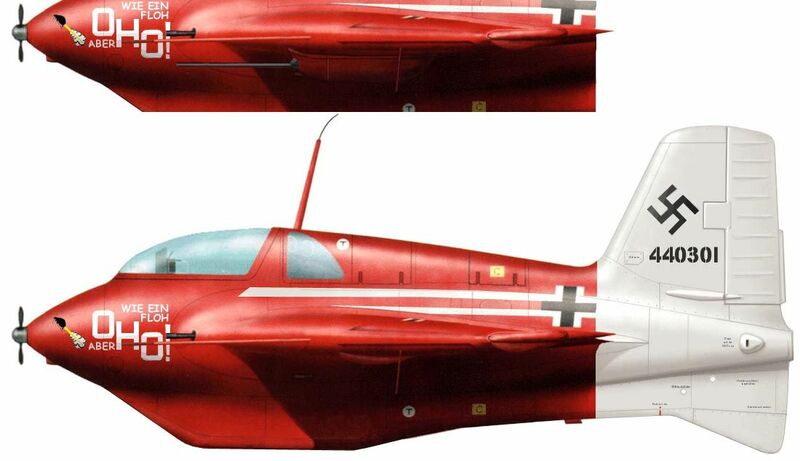 As an emergency programme, all Me 163K-0 were delivered in 'prototype' Lichtblau. This RLM76 was then overpainted with squiggle patterns or blotches of Graugrün (RLM74) or Dunkelgrün (RLM71). Werk nummer 440091 was assigned to KsRj (Katapultschiff für Raketenjäger) Bjørnungen (formerly the coastal freighter, D/S Tyssedal out of Bergen). This aircraft served as an operational conversion trainer, flying four missions before being lost when its wingtip 'hook' was torn off during a retrieval attempt on 13 September 1944. The second aircraft is a series Me 163K-1 armed with twin MG 151/20 cannon. Covered with good-luck slogans („Hals- und Beinbruch“ to port and „Holm- und Rippenbruch“ to starboard), Wk Nr 440117's did seem blessed. With three different pilots, '117 was able to complete 18 missions. Eleven of those flights were made by Oblt WE Schäfer, the first Katapultjäger pilot to be awarded the 'Ritterkreuz des Eisernen Kreuzes' medal. Note that Wk Nr 440117 is fitted with replacement wings. shortly before the aircraft was caught on its catapult by RAF Beaufighters which set KsRj Gudrun ablaze with 60 lb rockets until she sank in the Flekkefjord. The first aircraft is an Me 163Ka-1 armed with twin MG 151/20 cannons in the wing roots and another pair of 20mm guns in underwing gondolas. Werk nummer 440301 was assigned to KsRj Oria (operated by Mittelmeer Reederei GmbH but converted to Katapultschiff für Raketenjäger at the Salamis Naval Dock). Piloted by a former member of JG 400, '301 wears the slogan („Wie ein Floh, aber oho!“) and rocket-propelled flea from JG 400's Geschwaderzeichen. KsRj Oria and its Komet were tasked with escorting resupply missions for the Dodecanese island beginning in Sept 1944. Wk nr 440301 only flew five operational missions. In late Nov 1944, her pilot misjudged the glide on his retrieval attempt off Patmos. The Komet splashed down short of the Oria, residual fuel exploding on impact. The second aircraft is an Me 163K-2 armed with twin Rheinmetall-Borsig MK 108 30mm guns. Munchausen riding his cannonball) on the nose and a Ritterkreuz on the tail. The latter did not represent an award. Rather, it was a talisman (as was the accompanying slogan -- „Schwein gehabt“). Operating out of Tromsø, Z33 protected northern convoys and its sister destroyers on minelaying duties. Wk nr 440347 had few opportunities for action due to rare encounters with enemy aircraft and icy conditions in these northern latitudes. In Feb 1945, Z33 ran aground at the entrance of the Burfjord. When RAF were spotted, Fregattenkapitän Menge ordered the '347 launched but the catapult mechanism had been damaged in the grounding. Hit by cannon fire from the attacking Mosquitos, the Komet blew up in a spectacular fireball on Z33's afterdeck ending the destroyer's days as a Katapultschiff. Both of us would love to see what others can come up with...Go Wild!!! 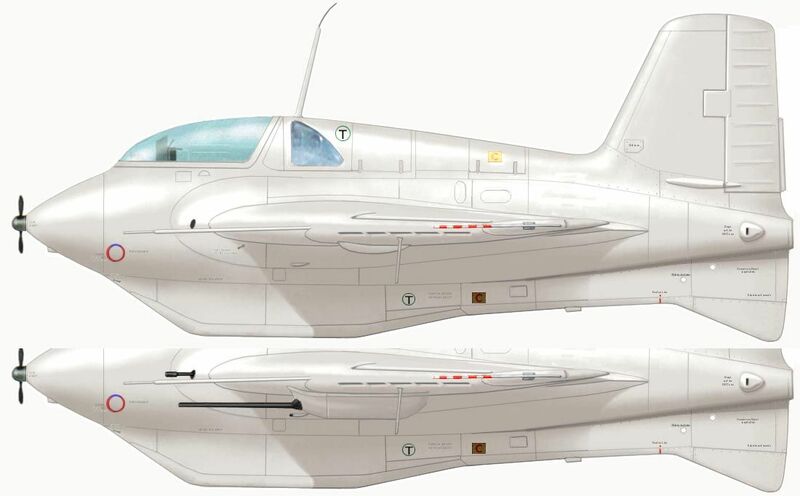 Now I want a Komet, darn you Greg!!!!!!! Gahhhhh must focus on ships....I must!!!!! Fantastic story and very believable too I think. I could see them playing around with this in real life and exploiting the heck out of it if it succeeded even a little bit. Love the colorful schemes! That rocket propelled flea is awesome! Do you have a larger version of the nose art? Do you have a larger version of the nose art? A slightly larger version of the nose art is attached. Seriously cool stuff going on here! I would imagine either the rear torpedo tubes or perhaps somewhere towards the stern would be the location for the launch rail. Remember that the Komets installations would not be pretty setups since they were hasty additions. Hmmm... I'm thinking something along the lines of the trio of Fletchers we briefly converted to handle floatplanes during the war. In that drawing, gun 3 and the after set of torpedo tubes would be replaced by a deck house and the cat and the handling boom would go behind the after funnel. Do you envision a fixed cross deck or a trainable cat? Any idea on the length? I'd imagine one of these things would need to be launched port to starboard or vice versa unless they wanted to expose vital parts of the ship to the exhaust. I'm thinking of using one of the old Tamiya Z-Class DDs with the twin 5.9" turret forward for this and do her up in a Western Approaches/USN Ms. 16 style camo for those North Atlantic convoy runs. What do you think? Might be my Beyond '46 GB entry if that's cool with you. Let me know man. Happy either way you want to go. I have some relevant info on the Komets and catapult if you are interested. Sure am man, check your PMs. Still, that is a rather violent way to "catch" a manned aircraft isn't it?